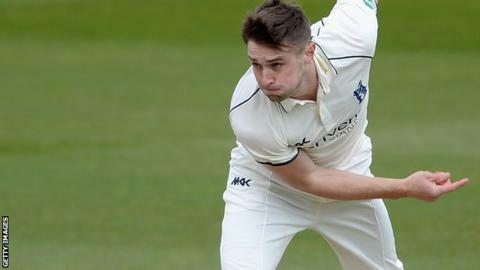 Warwickshire's Chris Woakes took a stunning career-best 9-36 at Edgbaston as he warmed up for a possible England Test recall by bowling out Durham. Woakes, who was called up to replace Ben Stokes for the second Test against Sri Lanka on Friday, went for 17 runs with no reward off his first six overs. He then took nine wickets in 14 overs for 19 runs as Durham, although saving the follow-on, were bowled out for 190. The Bears, who totalled 313 in their first innings, then closed on 15-2. Woakes was due to travel to Chester-le-Street straight after the end of day two, to be replaced for the rest of the Divison One game by leg-spinner Josh Poysden, with the approval of both Durham and the ECB. He therefore came in to open when Warwickshire's second innings began, but he was one of two quick victims for former England seamer Graham Onions, who also bowled nightwatchman Chris Wright. Wright had more success in his time at the crease earlier in the day when he extended his ninth-wicket stand to 52 with Jeetan Patel, helping the Bears add a further 40 runs to their overnight 273-8. In reply, Durham made a sound start as openers Mark Stoneman (36) and Keaton Jennings (29) put on 61 for the first wicket, only to cave in alarmingly once Woakes had made the breakthrough. Woakes' bowling figures were the best by a Bears player since the late Jack Bannister took 10-41 against the Combined Services at the old Mitchell & Butler ground in 1959. Eric Hollies also took all 10 for Warwickshire in a Championship game in 1946. Woakes' nine wickets, four of them caught behind and two clean bowled, are the eighth-best figures in first-class cricket for Warwickshire. His own previous career-best was 7-20 against Hampshire, also at Edgbaston in 2011. He is the first Bears player to take eight wickets or more since Imran Tahir in 2010 - and the first to take nine in an innings in English cricket since James Harris took 9-34, also against Durham for Middlesex a year ago. The 27-year-old, who won the last of his six England caps in January in South Africa, has taken eight Test wickets at 63.75 and made 129 runs at 21.50. But he has started the 2016 season well, having now taken 21 County Championship wickets, as well as hitting a century when captaining the county in Ian Bell's absence in last week's win against Nottinghamshire. "I just hit my rhythm. I got the wicket of Mark Stoneman and after that felt really good. I probably felt as good as I have all year so it's nice to be in that rhythm going into a Test squad. "To get a five-for was nice but then to finish it off with nine was pretty special. But there was some really good work done at the other end. It just happened to be my day to take the wickets. "It just clicked from that end after lunch. I didn't try to do anything different to what I normally do but it was fortunately just my day. The ball swung all day which was nice. "Yesterday we were 200-2 and that was a position we definitely didn't expect to be in because the wicket did a bit but Andy Umeed got a great hundred." "Woakesie was pretty impressive. He extracted more than anyone else out of the surface and was pretty relentless in doing so. "They kept it tight at the other end so the pressure kept building as the scoreboard didn't move and he put enough balls in a good area to take wickets. "Credit goes to Woakeie. He's going to get the headlines but I imagine they will be pretty happy with the way they bowled as a unit. "We tried as best we could to stick it out but it seemed every time he was about to take a break he took a wicket."